What gave you an advantage once may no longer be helping you. 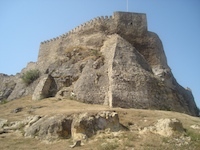 Fortresses just aren't relevant today. Surami Fortress, Georgia.I've been thinking a lot about openness recently. Open-source software, open publishing, and open data are important themes in science today, but not really in business. I think this is going to change in the coming decade, as open-minded young professionals with openness in their blood infiltrate management. I hope Agile* is part of this shift. Years ago, oil companies were closed systems. They had secrets. They had large research divisions, rivalling universities in size and scope. They developed their own technology, wrote their own software. The people who worked in these companies were trained in-house, and had long careers. These companies competed with each other on an every-man-for-himself basis, with little regulatory intervention, and little more than admiration and awe from the general public, just glad for its precious petroleum. has customers who don't want or like their product, but are simply addicted to it. In this environment the research is shared with competitors, the technology is the same as everyone else's, the employees switch companies regularly, and everything is done under the public's disapproving gaze. It is clear that competitive advantage ain't what it used to be. Yet oil companies are stuck in yesterday's mindset, hiding all their data, software, technology, and ideas, even (especially?) the ones that are generic, or useless, or just wrong. What a waste of energy. So what is your competitive advantage? In the next post, I'll take a look at what I think sets companies apart, and what I think we can safely share. In the mean time, let us know what you think.